If there’s any doubt how much I loved Last Stand of The Wreckers, check out my MMC Spartan review intro as I go into plenty of detail there. I’ve been waiting for this figure since the very first teaser released by MMC and, spoiler alert, he does not disappoint. IDW's version of Overlord is one of the most interesting Transformers villains I have ever experienced and his personality is so unique in the Transformers pantheon of characters. Unlike your typical power hungry Decepticon he isn't interested in leading the Decepticons, or sneaky underhanded attacks. This masochistic Phase Sixer is powerful, confident, and not afraid to tell anyone what he thinks of them. Longing for a true challenge in combat he disobeyed Megatron's orders and eventually took over the Autobot prison colony of Garrus-9, in an attempt to lure Megatron into a battle to the death. 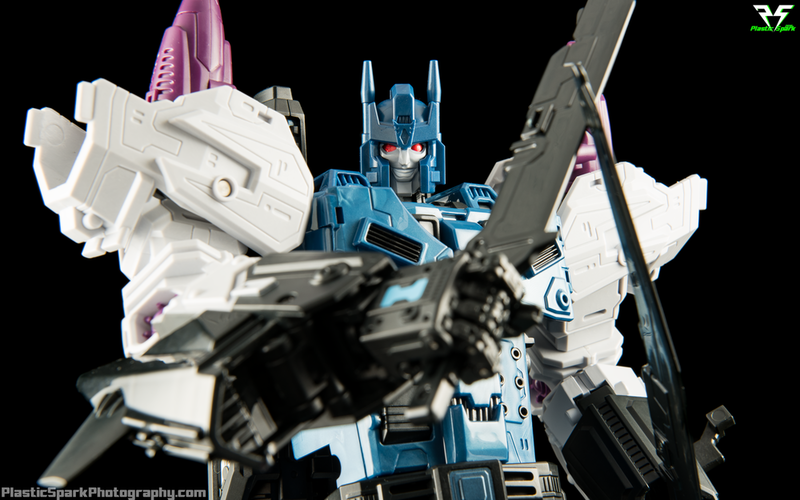 Overlord felt the only true test left in his life was to defeat the one bot that he could never take down in the pits, the Decepticon Leader Megatron. He never got his chance however as Megatron had already been defeated by the time the Wreckers showed up for a visit. 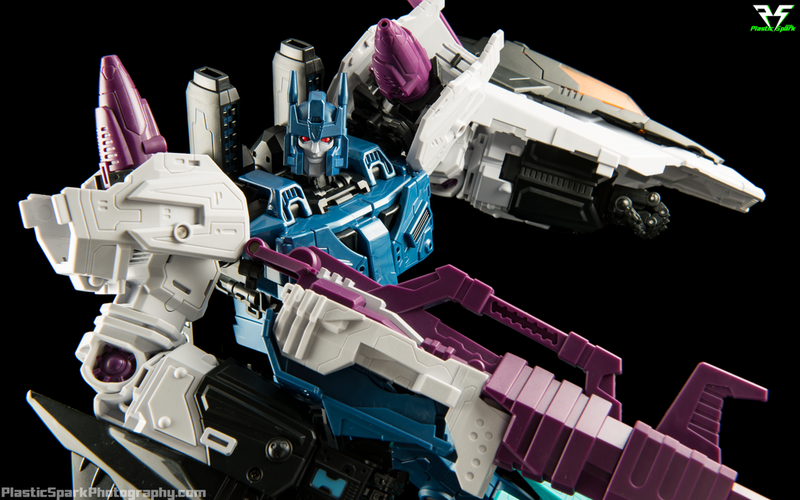 MMC R-17 Carnifex retails for around $184.99 USD from most retailers. I got mine from Blast Off Toys, if you're in the Calgary area check them out for third party and masterpiece Transformers! Without further ado let's get into the review. Hulkbuster eat your heart out! Carnifex is unique when it comes to vehicle modes. 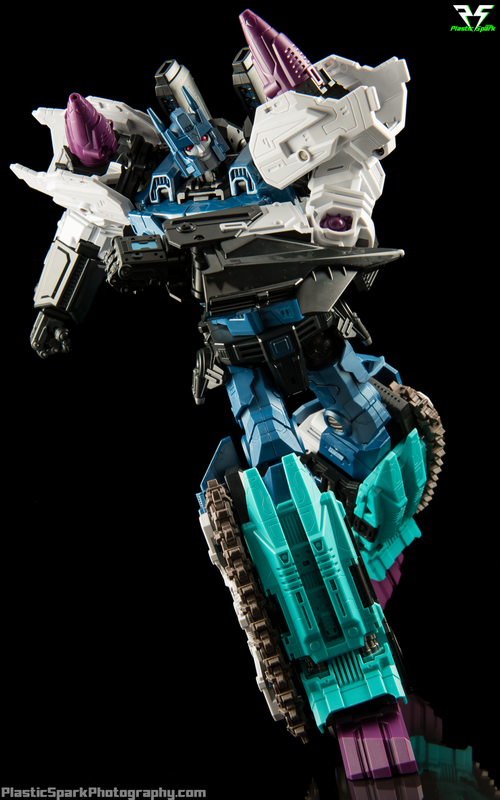 Overlord, the Transformers character that Carnifex is based on is technically a Duocon (one robot formed by the combination of 2 vehicle alt modes, neither one able to turn into an independent robot of their own) although he is never truly classified as such. His legs detach at the upper thigh and combine to form a large tank, with the upper body becoming a large supersonic jet. The original G1 version was piloted by 2 Godmasters, named Giga and Mega, however this rendition is based on the IDW version of Overlord, a wholly independent character with no ties to the original G1 Godmasters. Tanks for holding my gun. Carnifex’s tank mode is an incredibly simple but satisfying transformation that likely will not require instructions for many collectors. Large and menacing, with real working rubber treads that are incredibly satisfying to mess with. They don’t grip the ground well enough to function perfectly but on the right surface they will roll. I would recommend carefully working the treads by hand first to crack them loose as they may be slightly stuck when he is removed from the packaging. The robot mode blaster becomes the center mass of the tank and is incredibly intimidating. The downside to this combination method however is that the gun is entirely locked in and cannot swivel or move in any way. This was a trademark characteristic of the original toy as well though and I can’t recall any moment in the comic book where the cannon swiveled so I’ll let it slide. The rear of the tank is a bit weak with some hollow space that seems out of place compared to the rest. 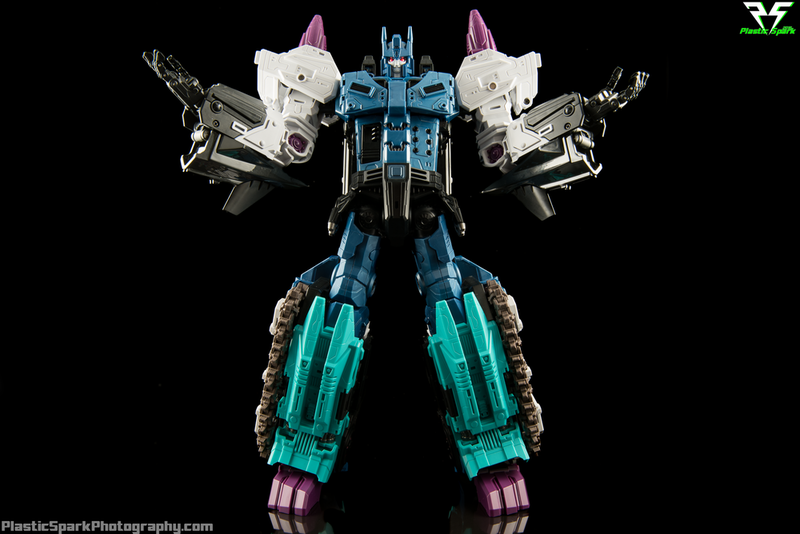 The turquoise flaps that form ankle skirts in robot mode can flip up resembling a cockpit of sorts, a nice nod to the original G1 design. I know it's just a toy but damn that looks good. 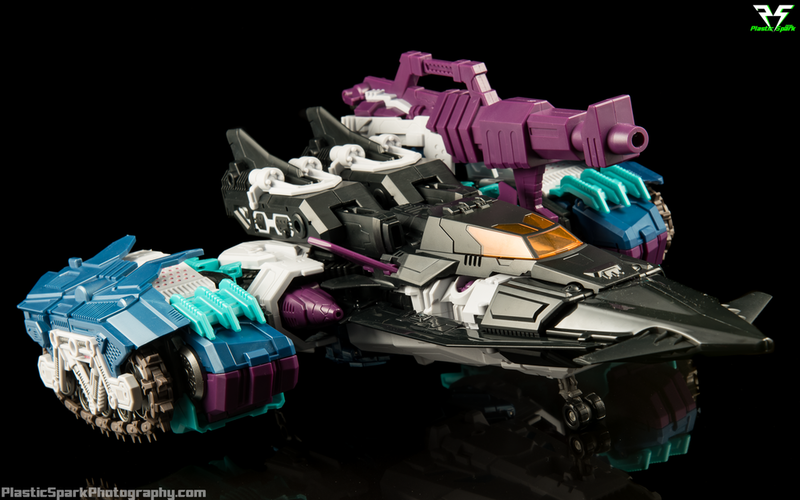 Carnifex’s jet mode looks absolutely incredible. The transformation is fairly straightforward with one exception. The shoulders. Do yourself a favor and watch a couple video reviews to see how the shoulder armor transforms as it can be quite nerve wracking following the photo instructions for this portion. Sleek and black, with a nice mix of glossy and matte finishes. This thing is absolutely huge, pictures don’t do it justice, and you have to hold this figure in hand if you ever get the opportunity. The rear mounted wings and long fuselage give it the appearance of a modified SR-71 or similar style of supersonic jet. 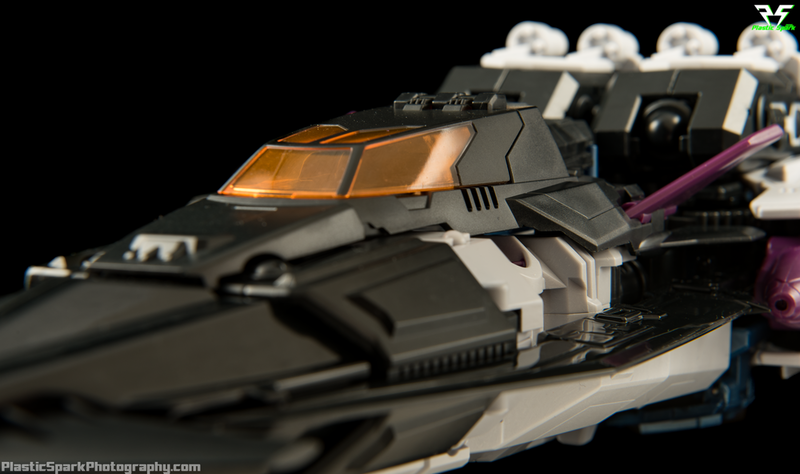 Large booster jets on the top rear of the vehicle give it a pleasant sci-fi vibe and the translucent amber cockpit stands out aesthetically in a way that makes me smile. Flip out landing gear on the underside of the jet allows for it to be posed grounded or in flight using a Tamashii stand or your preferred flight stand. There are no dedicated 3mm peg holes for stands unfortunately so a trident style flight stand would likely be your best bet as the figure is quite heavy. Tank Plane! Now with more physics defying McGuffins! 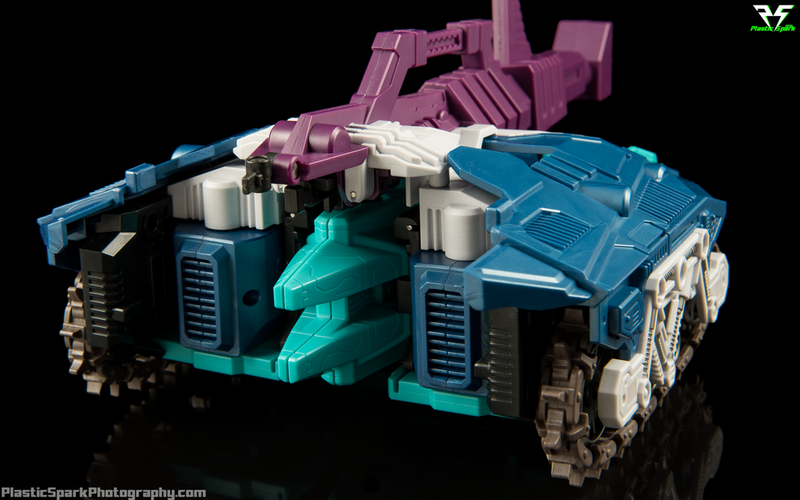 Now the trick here is that these 2 alt modes can combine into a heavily armored, high powered flying tank jet…thing. By reversing the transformation of the wings on the jet, you can clip the tank halves to the side of the jet mode, with the blaster rifle wedged into one side to make an awesome, but doubtfully aerodynamic, attack mode. Everything pegs together incredibly tight and nothing about this mode feels wobbly or unsafe. I flew it around the room like a little kid and nothing came loose at all. It doesn’t happen very often but the vehicle modes for Carnifex actually make me wish I had a second copy of the figure to keep one transformed at all times, they are that much fun. In an homage to the G1 Overlord figure, Carnifex has an attack base mode as sort of a bonus feature. There are no instructions for how to transform him into this mode but there is a photo on the back of the package that is pretty easy to decipher. While I don’t really care for disjointed base modes like this one, preferring a more solid looking base like Fortress Maximus or Metroplex, it is a fun option for those who want all the functionality of the original character despite the overly modern roots of this particular figures design. At least it’s on topic with the current Hasbro toy line utilizing bases and mini figures as well! Aww, That's cute, They think they're third party too. Carnifex’s robot mode caused my mouth to hang open like a cartoon character the first time I saw him assembled on my desk. This is a huge, intimidating, and incredibly well detailed toy, if you can call it that. A work of art might be a more appropriate term for something this colossal and overwhelming. Despite having several MMC figures in my collection, as well as many other third party offerings, Carnifex is the first figure to truly cause me to question the meaning of “Quality” when it comes to my Transformers collection. Nothing in the Generations/Classics line, and I truly mean nothing, compares to the level of polish and quality exhibited by Carnifex. He has made me doubt the value of figures in my collection, as if they are not worthy to share a shelf with this almighty behemoth. 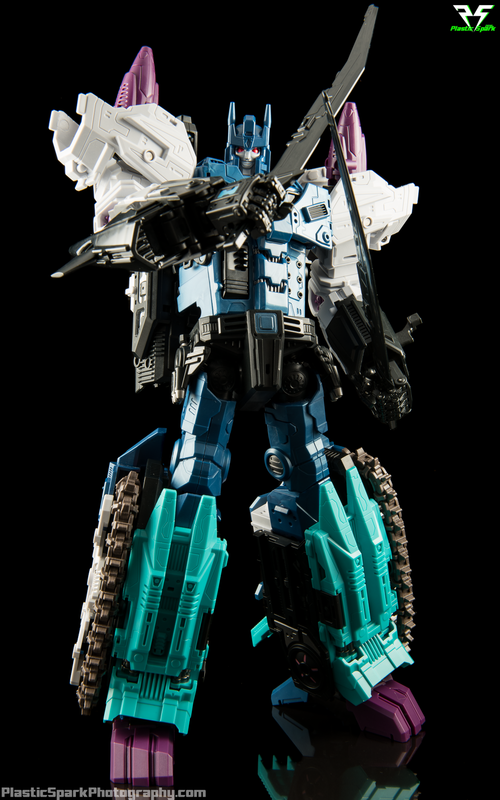 Carnifex looks as close to Nick Roche’s depiction of Overlord in the Last Stand of The Wreckers as I think could possibly be committed to plastic. The face sculpts are fantastic with Overlords signature lips, crimson eyes, and a smile that could put the Joker to shame. He comes with a full replacement head with a broken optic in the right eye as an homage to the 5th issue of the comic series where Impactor impales him with his tether hook. The head has to be unscrewed in order to replace it, which is honestly one of my few complaints about this figure as over time, too many head swaps could lead to stripped screws or screw holes. 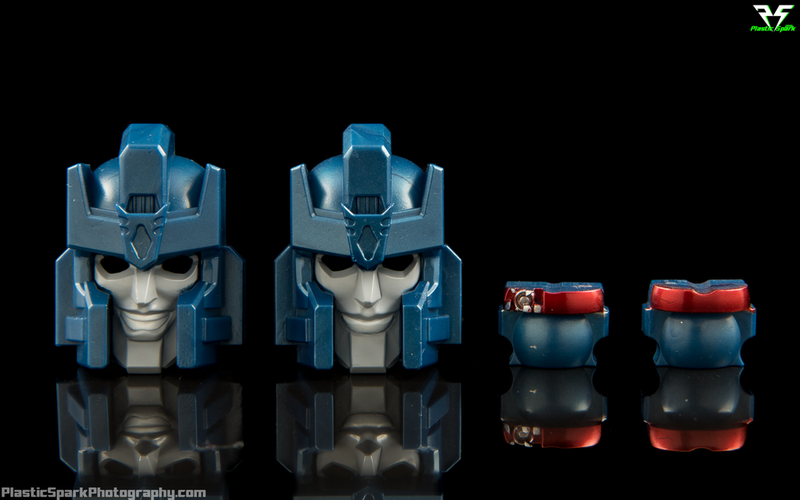 The eye piece can be swapped between the 2 heads so you can have the wide smile, or more subdued smirk, with either of the eye options. Unsettling. Yeah that's the word! Every single joint feels tight and solid, with a great range of movement. Almost any pose you could possibly want to achieve is possible with this figure. I would have liked to see some double elbows, and ball joints at the base of the finger knuckles but otherwise he has every piece of articulation I could possible ask for. His balance is incredible and weight distribution is top notch. Not a single piece of die-cast on this figure but honestly you'd have a hard time noticing as he is incredibly heavy and incredibly solid. Everywhere you look Carnifex is covered in sharp details, panel lines, and tech detail that adds to his premium feel. He's over a 12" tall, standing on one foot. Bless you MMC. His chest panels can open up to reveal missile pods, which are removable possibly to leave the option to include the G1 Godmasters eventually. 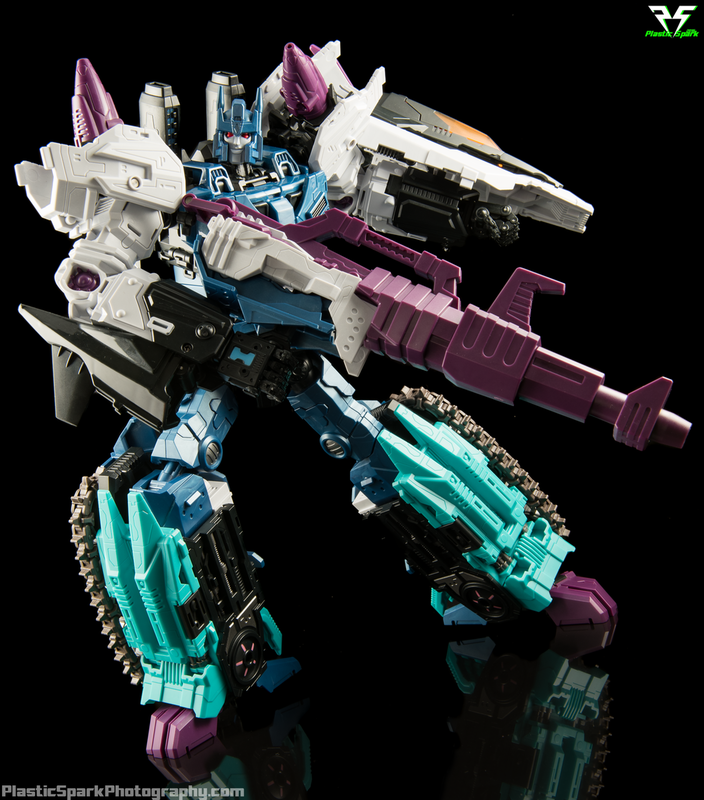 He has slide out cannons on his left side and a fold down blaster that can deploy from the right. These gimmicks are a lot of fun and easy to deploy without the need for any tools. He can hold his blaster one handed, outstretched with no sag in the arm at all. This blew my mind considering the size of his rifle, this is something that no other figure of this size in my collection is capable of doing, including MMC's own Feral Rex! He's not over compensating, he's just efficient. The jet cockpit can be equipped as a shield mounted to Carnifex's shoulder armor, gauntlet, or held in his hand thanks to the multiple handle options included. The glossy black blades attached to the shield can be removed and used as swords, they tab into Carnifex's hands without any trouble and look very menacing. 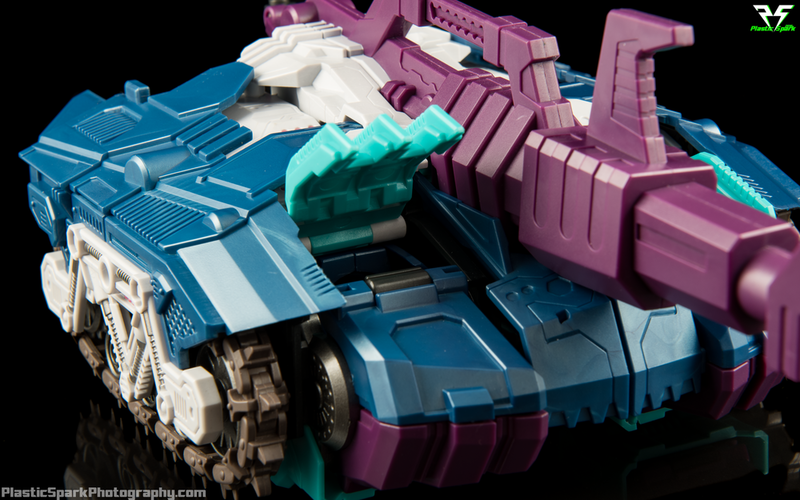 I personally don't consider this to be parts-forming as the cockpit becomes weaponry which is typically not entirely contained on Transforming figures like this. I wish I could pull off teal boots the way he does. 1x Shield w/ 2 different mounting pieces. Carnifex is unlike anything I have ever experienced. The sheer heft and sturdiness coupled with the nearly perfect representation of Overlord from the Last Stand of The Wreckers comic book make this a figure you absolutely can not miss. Do whatever you have to in order to at least experience this figure in person. I absolutely guarantee you it is worth it. 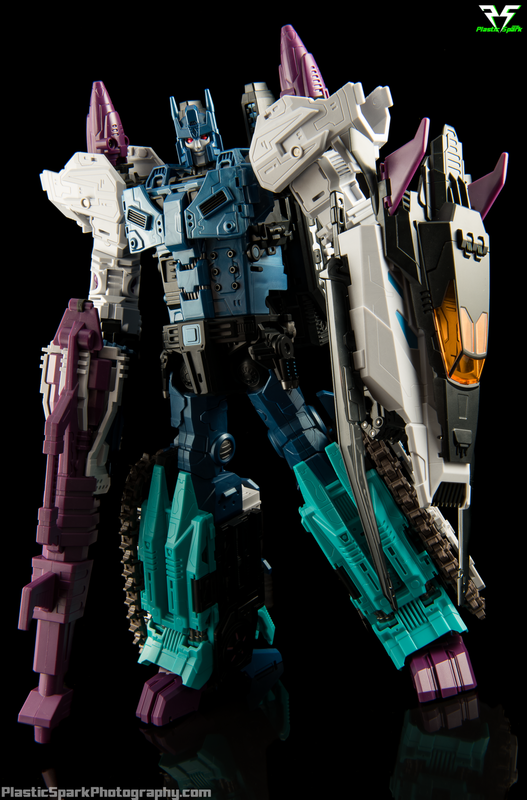 As of December 2016 Carnifex is the crown jewel of my Transformers collection and I can not wait to see what's to come in 2017 from Mastermind Creations. There is no contest, this is absolutely going to be my favorite toy of the year. 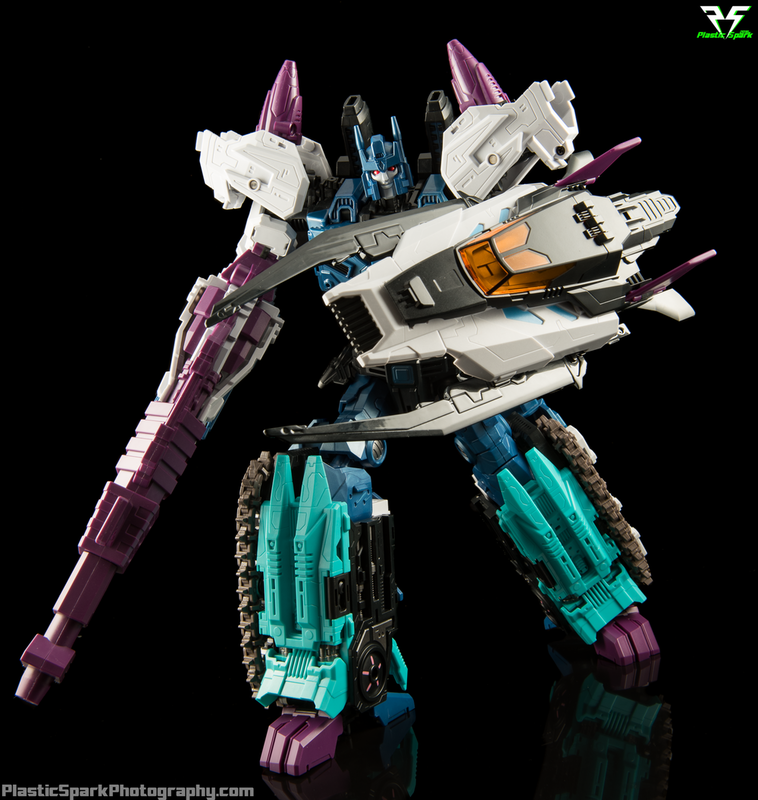 What do you think of MMC R-17 Carnifex? Are you an MMC true believer for life like me or has the experience left you less than satisfied? I'd love to hear from you in the comments section below or send an email to PlasticSparkPhotography@Gmail.com!